Pakistan votes in landmark national and provincial elections. The vote marks Pakistan’s first transition from one civilian government to another in its 66-year history. A bomb blast in the port city of Karachi on Saturday morning left 10 people dead and 32 others wounded, a hospital official said. Tens of thousands of troops are deployed at polling stations after the Pakistani Taliban threatened to carry out suicide attacks. Hours before polls opened, Pakistan sealed its borders with Iran and Afghanistan in a bid to keep foreign militants at bay. Officials said the borders would remain closed for the next three days. Queues started forming before polling stations opened at 08:00 on Saturday. At one polling station in the capital, Islamabad, more than 200 people waited patiently to vote. EU observers in the eastern city of Lahore said that voting there was going smoothly and without any interruptions. 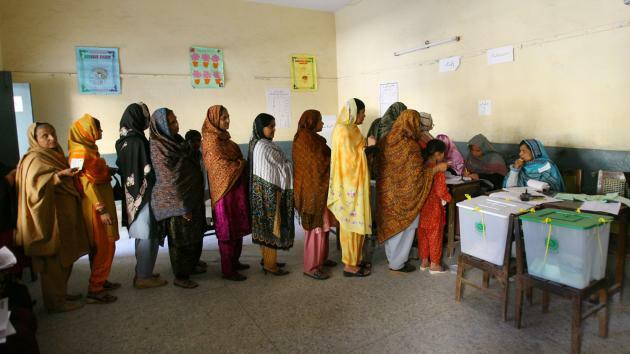 In Peshawar there were long queues of women waiting to vote. Many are voting for the first time and are excited about being part of a historic change. Polling stations will close at 17:00. The Taliban on Friday warned voters to boycott polling stations in order to avoid attacks on the offices of political parties. The militants have been blamed for numerous attacks throughout the campaign on Pakistan’s three most prominent liberal parties. The Pakistan People’s Party (PPP) along with the Karachi-based Muttahida Quami Movement (MQM) and the Awami National Party (ANP) have been singled out for attacks by the Taliban. As a result, the parties were forced to curtail their election campaigning. Around two hours after polling started, a bomb attack was reported in Karachi, apparently targeting an ANP candidate outside the party’s political office. The attack happened in the Landhi area of Karachi, an industrial district known for Taliban activity. Another ANP candidate and his son were shot dead close to the area last week. There were also reports of explosions in Peshawar in the north-west of the country and Quetta in the south-west. At least five people were hurt in Peshawar when a bomb went off attached to a motorcycle. Militants have so far avoided targeting the campaigns of Pakistan Muslim League-Nawaz (PML-N) of Nawaz Sharif and the Tehreek-e-Insaf (Movement for Justice) party of Imran Khan. Nawaz Sharif, who was deposed as prime minister in a military coup 14 years ago, is seen as favorite to return for a third term of office. In a bid to clamp down on corruption, election officials say electoral rolls have been refreshed and a text messaging service will provide voting information to individuals. In previous elections there have been accusations that candidates and some state institutions rigged the vote by setting up ghost polling stations and creating millions of fake voters on the electoral rolls. However, the Human Rights Commission of Pakistan on Friday expressed “acute concern” about the manner in which the violence has “impaired the fairness of the elections almost beyond repair”. It called on all institutions to “stretch themselves to their absolute limit to ensure security of voters, candidates and polling stations on Saturday so that the people can exercise their right to choose their representatives”. The Taliban threat sparked a major security operation leading up to the vote. More than 600,000 security and army personnel have been deployed to guard against possible attacks on polling day. On Thursday, the son of former PM Yusuf Raza Gilani was abducted during a rally.